Bird and flower painting scroll Kacho-ga "Seasonal Kakejiku of the spring"
Seasonal Kakejiku of the spring. SIZE: width 54.5cm, height 190cm. The original picture of this one is drawn by Shimizu Gento. This natural purplish gray frame is bringing out the small bird, red color and white color of the plums. It is hanged in the spring. 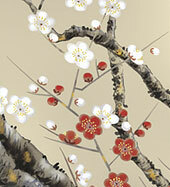 UME NI UGUISU: Japanese bush warbler and plums. The theme is popular in Japan. You can feel like a season of the early spring in the picture. UGUISU: The voice of Japanese bush warbler is listened in early Spring. UME: Plums flower bloom in early Spring. Also, Japanese people usually use red and white color for a traditional celebration.